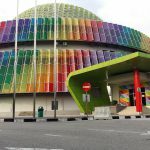 In Malaysia, the official postal service is Pos Malaysia. It is usually the choice by default since there are so many branches available. You can recognize them by the usual huge mail boxes located outside the pos office. Some travellers tend to send back items home in overseas once the luggage gets a lot because it is better to send it back than to lung it around. After all, if you do not post it back, it’s really a burden to carry it around and will hamper your movement from one place to another. Furthermore, overweight charges imposed by airlines are ridiculously expensive- for instance, I was sending my friends back to Bangkok from LCCT terminal and Air Asia charges RM20 (about USD 5.88) for each extra kilo. 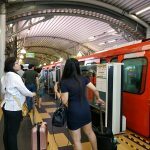 For Air Asia, they limit the hand luggage to max 7 kg and check in luggage to 15kg (if you have check in luggage, you need to pay extra RM5 when you are booking the ticket). The only thing is that you need an address of someone in Malaysia- in case the package that you send gets returned due to non delivery (no one to acknowledge the item). For low end courier service, one of the cheapest is Poslaju. No doubt, Poslaju has its share of complaints (like hard to get anyone to pick up the phone, etc) but personally, if you are chosing between the budget ones, then Poslaju would be a better choice. So of the budgeted ones (I don’t want to name names) do not have a proper computerised tracking system so it makes it hard to track delivery). In my previous job, we have outsource a huge volume of delivery (hundreds of thousands per month and if there are certain launches, even millions) via Poslaju. Of course, if the volume is so huge, even 0.01% undelivered rate will result in substantial amount of complaint. Relatively, compared to other budgeted courier service, I would stick to Poslaju. Recently, I had to courier an important document to a lawyer’s office- I went to a company that handles delivery and they sign up on behalf of a few courier companies. 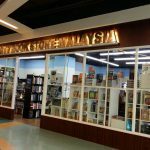 Even the staff there who is quite experienced, told me that Poslaju would be more reliable (that is we are not talking about high end services like DHL, Fedex which are of course quality for money). 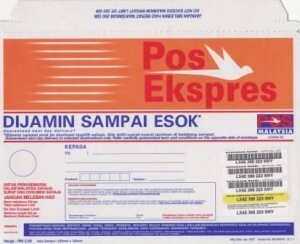 Basically, it is an express postal service that delivers to selected locations in Malaysia by the next day. So instead of paying RM0.30 for a normal delivery, you pay a few ringgit for the same service- because the postman will just drop the envelope in the receipient’s mailbox- there is no acknowledgement required. Therefore it is cheaper than sending via Poslaju courier.